NASA's Dawn spacecraft has beamed home the first close-up photo of the huge asteroid Vesta, just days after entering orbit around the distant space rock. The new photo, which Dawn snapped for navigation purposes on Sunday (July 17), shows Vesta in greater detail than ever before, researchers said. Astronomers have been observing the gigantic space rock for 200 years, first with ground telescopes and later orbiting observatories, but have never been able to see it so clearly, they added. "This region of space has been ignored for far too long. So far, the images received to date reveal a complex surface that seems to have preserved some of the earliest events in Vesta's history, as well as logging the onslaught that Vesta has suffered in the intervening eons," Russell added. NASA's Dawn spacecraft took this image of the south polar region of Vesta, which has a diameter of 330 miles (530 kilometers). The image was taken on July 9, 2011, and it has a scale of about 2.2 miles (3.5 km) per pixel. To enhance details, the resolution was enlarged to .6 miles (1 km) per pixel. This region is characterized by rough topography, a large mountain, impact craters, grooves and steep scarps. At 330 miles (530 kilometers) wide, Vesta is the second-largest object in the main asteroid belt between the orbits of Mars and Jupiter. It's so big that many astronomers classify it as a protoplanet, saying that Vesta was on its way to becoming a full-fledged rocky planet like Earth or Mars before Jupiter's gravity stirred up the asteroid belt. Dawn arrived in orbit at Vesta at about 1 a.m. EDT Saturday (0500 GMT), becoming the first probe to enter into orbit around an object in the asteroid belt. Because of time zone differences, the historic event occurred late Friday night at NASA's Dawn mission control center at the Jet Propulsion Laboratory (JPL) in Pasadena, Calif.
"Dawn slipped gently into orbit with the same grace it has displayed during its years of ion thrusting through interplanetary space," said Marc Rayman, Dawn chief engineer and mission manager at JPL. "It is fantastically exciting that we will begin providing humankind its first detailed views of one of the last unexplored worlds in the inner solar system." Many more good photos of the huge space rock will doubtless come back down to Earth soon, especially after Dawn begins gathering science data early next month. Right now, the spacecraft is still in its approach phase. During approach, the Dawn team will continue a search for possible moons around the asteroid; obtain more images for navigation; observe Vesta's physical properties; and obtain calibration data, researchers said. The $466 million Dawn mission launched in September 2007. Since then, it has logged about 1.7 billion miles (2.7 billion km) chasing Vesta down. The spacecraft's work won't be done when it wraps up investigations at Vesta. In July 2012, Dawn will head off toward the dwarf planet Ceres, the largest object in the asteroid belt. It will arrive at Ceres in February 2015 and undertake a similar study of that huge space rock. Though they both reside in the asteroid belt, Vesta and Ceres are very different bodies. Ceres is more primitive and wet, possily harboring water ice. 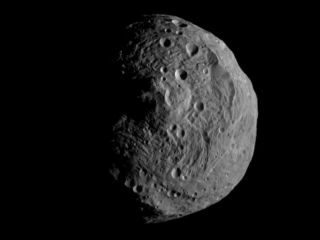 Vesta, on the other hand, seems to be drier and rockier, researchers have said. A detailed study of these two gigantic asteroids could shed light on how rocky bodies coalesced and evolved in the early days of the solar system, researchers said. This information could bear on how our own planet — and Mars, Mercury and Venus — came to be.